How do you do fellow kids? Yes it is I, the Hip Master General, Dinosir. Here once again to tell you about games I am making. This time we'll be focusing on art direction of my newest upcoming smash hit game entitled, Super Sportsball. In the last Joy of Deving I talked about how there are multiple answers to the same problem when developing games. I also covered how there aren't necessarily right or wrong answers, just some work better for different people. It's definitely one of my favorite parts of the #devlyfe. If you missed the last entry check it out here. This week we'll be focusing on a recent change in art direction and why I came to this decision. 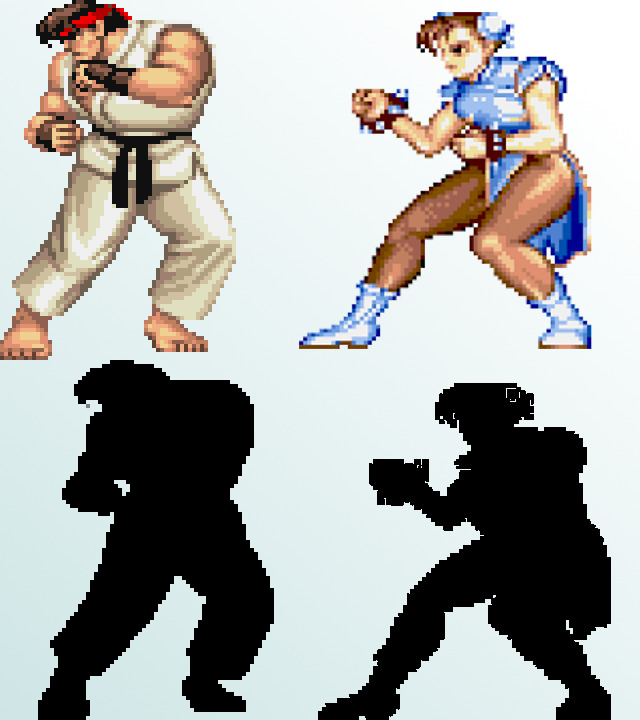 For reference please see the picture of the old art style down below. It wasn't near as detailed as it would've ended up looking like when finished but it's good to have a reference. Originally there were several reasons for this initial art direction. Firstly, proceeding the development of Aftermath Y2K I really wanted to develop a title that would show of my talents as not only a pixel artist but an animator as well. This called for a larger sprite set so I could have more detail. However I didn't want to go too large. You see in my head this game looked like Super Mario land on the gameboy. I wanted very pixely art. So instead of doing 100x100px or 64x64px I went with 32x32px. In the end I couldn't really achieve anything I wanted with this sprite style. It just looks meh and generic. Really I should've known from the beginning because my original vision strongly contradicted what I was trying to accomplish. So I had a decision to make. 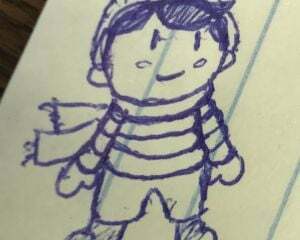 Either follow my original vision, or pursue further detailed sprites of 64x64 or 100x100. So why didn't I go larger? This looks pretty good right? Well the answer is time. To give you an idea this game was a temporary hold over until I decided which game I was going to pursue next. To which I now know. Thus I planned on developing this game for around 2-3 months. However this would not be possible for 64x64 or 100x100 sprites. It would've taken me far longer than that to properly develop art and animate a decent roster for this game. Not to mention how long it would take to properly make gorgeous background images to match. It would've been swell in my portfolio but I just want to move on. So I chose smaller. It was faster, easier and it closely matched what was in my head. Now I say closely because if you remember I was talking about SML style. 1) Gameboy palette is ugly. It just is. Those greens make me sad. Nostalgic but sad. I could've pursued black and white but because the reason listed in number 4, that didn't make sense either. 2) the gameboy palette is very limited. 3) I just made a game with a limited palette and I kinda wanted freedom from that. 4) Most importantly it would've been difficult in a 4 player game to tell the difference between characters with only 4 shades. Thus, I changed my idea and found a true compromise. Between what was in my head and what would work. Overall I'm very satisfied with the current art direction. The art direction also fits the theme of micro-rounds. Each round is only 10 seconds long right now. Thus having micro sprites seems appropriate. However I would be lying if I said that how the game looked was the only factor in this decision. In order to save time in development I decided to use GameMaker Studio 2's built in physics engine. Unbeknownst to me this engine has a huge flaw in it. The max speed of an object is directly tied to the framerate. I found out that an object could only move 20 px a frame. So the ball in the game was locked to a max speed of 20px/fr. Which seems fast, and it is; however when you screen is 480 px wide. The ball would take 24 frames or roughly 1/3rd of a second to cross the entirety of the screen. This was fine, but I really wanted to make the max power give an extra speed bonus and make it near impossible to dodge. (This is because the throw speed uses a meter like the one in tecmo bowl where if you wait too long the meter starts over and thus you have ~1 frame to get a perfect throw, and if you miss that one frame you get a 0 throw speed and fumble the ball. On top of that there is a recovery time until you can try and pick the ball up again. So I wanted to reward those willing to risk it to get 100 power.) It wasn't too terribly easy to dodge/catch, but 1/3 is very doable especially with how forgiving the engine is with catches. Still at 32x 32 it wasn't bad, but if you recall I was thinking of moving the sprites at least 64x64 which meant that the backgrounds would've also increased to at least 960x wide. Then at 20px a frame, it would've taken the ball 48 frames to reach from or 2/3rds of a second. That's way too much time. Now of course I could've decided to just increase the framerate to 120 fps. While I don't for see that causing many issues, it may have. Who knows? I didn't do this, and this ball speed wasn't the main factor in my decision but it did play a large factor. To give you an idea the screen in now 160px wide and at 20px/frame; it takes 8 frames or a little over 1/10 of a second to travel the width of the screen. Which seems to be in a sweet spot for fairness to dodge and reward for the thrower to risk going for max speed. Lastly I'd like to cover my decision for anthropomorphic animals. Why animals? Cause animals are super awesome, that's why! However, there's also a more practical reason. 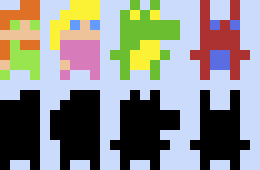 With an 8x8 based sprite having different animals allows for each character to have a different silhouette. Why is that important? I'm glad you asked Timmy! Well, in a fast paced game like this or even fighting games; having a different silhouette allows your brain to quickly recognize which character is you, and which is your opponent. Now normally this is done with outfits and having other factors come into play, like physic, hairstyles, and even moves or stances between characters being different. However with only 8x8 to work with you can't really make silhouettes of people different. Animals though, you can. The have different ears, tails, body, nose, etc. that you can work with. This helps the silhouette become far more prominent, and thus the choice, for me was obvious. Also did I mention how awesome animals are?! Well that's all folks. I hope you enjoyed this little insight into my brain and the decisions I make.